David Yurman, America’s premier fine jewelry and timepiece company, celebrates the opening of its boutique at CityCenterDC in Washington, D.C. The store represents a complete expression of the brand’s unconventional artistry and design, and is a destination for gift giving for every special occasion. 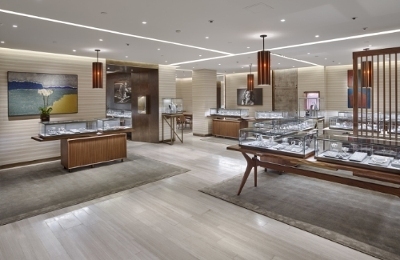 It is David Yurman’s first retail location in D.C., and is part of a world-class luxury lifestyle development that attracts visitors from around the world. The modern, intimate space expresses founders David and Sybil Yurman’s love of craft and design. Natural materials such as stone flooring, live edge wood counters, and artisanal bronze finishes create a warm, welcoming environment. The “Heritage Wall” – a gallery of the brand’s history and the Yurman’s inspirations – depicts more than 30 years of innovative jewelry design. Through images and archival pieces, customers learn how David, a sculptor, and Sybil, a painter, grew from selling jewelry at local craft fairs in the 1970s to creating designs that are recognized everywhere. Perennially popular in D.C., David Yurman’s most renowned design is the Cable bracelet, a helix of gold or sterling silver, often with gemstone end caps. Like many David Yurman collections, it is designed to be worn in multiples, creating an effortless layered look that appeals to women worldwide. These instantly recognizable “stacks” are highly versatile, going from morning meetings to evening fundraisers to weekend brunch. At the new 2,172-square-foot boutique, guests can shop all the signature David Yurman collections, including Renaissance and Albion®, as well as discover exciting new ones like Belmont®. David Yurman sales professionals are always available to help choose the perfect gift, whether for someone special or as a treat for oneself. The boutique will carry David Yurman’s full selection of gold and sterling silver designs for women, children, and men; timepieces; DY Signature pieces; an assortment of fine jewelry; as well as styles from the Wedding Collection. David Yurman’s D.C. boutique is located at CityCenterDC 924 Palmer Alley NW, Washington, D.C. 20001. David Yurman was founded in New York in 1980, and quickly became known as America’s leading fine jewelry and luxury timepiece brand for men, women, and children. Its signature gold and silver designs; diamond, pearl, and gemstone jewelry; and Swiss-crafted timepieces are renowned for capturing the essence of relaxed American luxury. David Yurman collections are available at 40 retail locations throughout the United States, France and at over 362 locations worldwide, through their exclusive authorized fine jewelry and timepiece network of retailers.